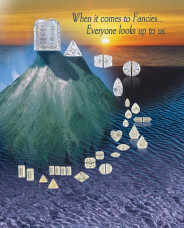 The Ten Commandments Diamond® - About the Trillion Diamond Company, Inc. Being a leader is not easy. It takes commitment to excellence, foresight and credibility. For over 75 years our family business, Trillion Diamond Company, Inc, has tirelessly pursued these values. As inventors and U.S. Patent holders of the original trillion cut diamond in 1955, now called Trielle®, we have become known as innovators that others follow. As specialists in fancy cut diamonds we offer a full selection of shapes, qualities, sizes and colors (including fancy colors), to fulfill our clients every need. We can also custom cut, recut, repair or match, your diamonds. We will accommodate the request to the best of our abilities in our own factory. www.TrillionDiamond.com. Visit your local jeweler and ask them to contact us.